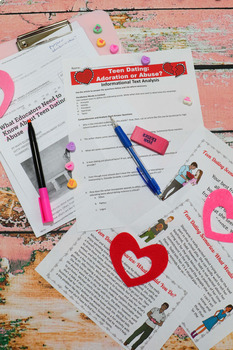 Valentine's Day can be a sensitive issue for teens for various reasons. February is not only Heart Month and Valentine's Day, but also Teen Dating Violence Awareness Month. This info text mini lesson is the perfect ready-to-go resource to practice close reading skills and comprehension! 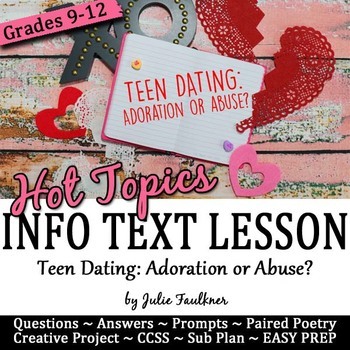 With this informative, not preachy, article on such a touchy topic for teens, your students will be engaged, informed, and ready to debate and discuss no matter their reading level or experience with close reading and annotating! The questions in response to an informational text are designed to have students truly dig into and respond to a text for comprehension and writer's techniques! 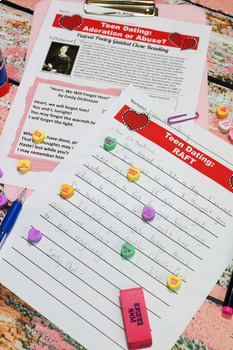 This resource is not just questions and answers - you are getting a full blown mini lesson plan complete with a collaborative dating scenarios activity for a starter, short answer questions, an argumentative writing prompt, a paired poetry guided analysis, and a creative, hands-on final task! Plus, all the answers are here, too! Are we creating a culture of cheating? Be the first to know about my new discounts, freebies and product launches. Look for the green star next to my store logo and click it to FOLLOW ME. Voila! You will now receive email updates about my store.